Deborah H. Atkin, M.D. uses a combination of three innovative Fraxel® Lasers to reverse precancerous sun-damage and improve skin tone and texture. Del Mar, CA — Though San Diego’s year-round sunny weather is enticing to many, the sun’s UVA/UVB rays can contribute to an increased risk of skin cancer and the development of unwanted skin conditions such as age spots, fine lines, and wrinkles, explains San Diego cosmetic dermatologist Deborah H. Atkin, MD. With the popularity of San Diego’s outdoor lifestyle, reversing sun-damage is particularly important for its active residents, she states. Fractionated Erbium lasers, such as the Fraxel® Re:store™ and Erbium/Thulium lasers such as the Fraxel® DUAL, are designed to treat mild age-related symptoms, Dr. Atkin notes. She also says these treatments can improve some types of acne and surgical scars, as well as enhance skin tone and texture. Fractionated CO2 lasers, including the Fraxel® Re:pair®, are designed to treat pigmentation, deeper wrinkles, and skin laxity, she contrasts. 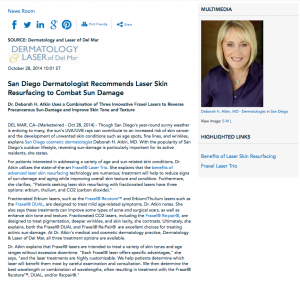 Ultimately, she explains, both the Fraxel® DUAL and Fraxel® Re:Pair® are excellent choices for treating actinic sun-damage. 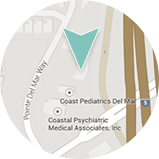 At Dr. Atkin’s medical and cosmetic dermatology practice, Dermatology & Laser of Del Mar, all three treatment options are available. 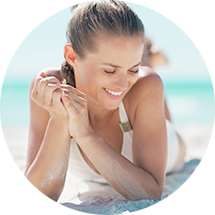 Dr. Atkin also indicates that Fraxel® lasers do not result in sun sensitivity or require any unusual skin care routine post-treatment. She says any age patient who is interested in reversing years of precancerous sun-damage, reducing fine lines, improving skin laxity, or diminishing scarring would benefit from Fraxel®. Ultimately, Dr. Atkin recommends laser skin resurfacing with Fraxel® Laser Trio for patients seeking tighter, smoother, more youthful-looking skin as each treatment can be customized to correct the unique skin conditions of the individual. A graduate of the University of California, Los Angeles School of Medicine, Deborah H. Atkin, M.D. is a board-certified dermatologist who has completed specialty training at the University of Arizona, Tucson. She has contributed to scientific journals and authored a chapter in a cutaneous surgery textbook. A member of several prestigious medical organizations, including the American Academy of Dermatology, the American Society for Dermatologic Surgery, and the American Society for Laser Medicine and Surgery, she is also an active volunteer for the American Cancer Society and the American Liver Foundation. Dr. Atkin is available for interview upon request. For more information about Deborah H. Atkin, M.D. and her dermatology practice, please visit dermdelmar.com and facebook.com/dermdelmar.